Luxury amenities, ocean views and proximity to posh nightlife have been the keys when it comes to luxury condos in Miami. Now, there is a new piece to the equation, space. 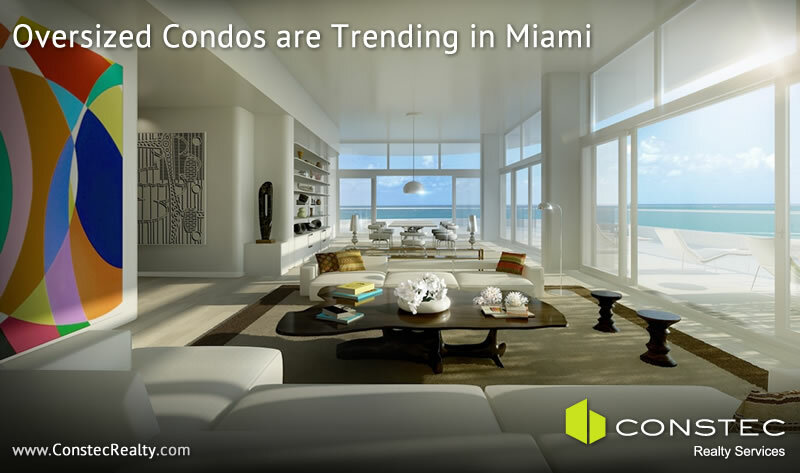 Square-footage is becoming more important in the Miami condo scene. The sizes of luxury condos are increasing. Buyers want size and space to go along with the amenities and scenic views. Not only are condo sizes increasing, but condos are being combined to create mega condos, sometimes combining as many as five units into one. Oceana Bal Harbour offers three floor plans between 3,000 and 4,000 interior square feet. Those are regular units, not the penthouses. Penthouses sizes soar in size from 5,904 to 9371 interior square feet. At Oceana Bal Harbour, the terrace space is just as huge as the interior with some floor plans having more exterior space than interior. The result of this is floor plans with a combined interior/exterior space of over 19,000 square feet for some units. Estates at Acqualina es otro edificio de condominios de lujo en construcción con planos de planta de gran tamaño. La planta más pequeña de aquí tiene 260 metros cuadrados interiores y la mayoría de ellos están en los 280 a 465 metros cuadrados. Faena House‘s A and B floor plans have interior square-footages in the 4,000s. Apogee South Beach is where the phenomenon of Miami oversized condos began. The floor plans at Apogee are all in the 3,000 and 4,000s. St. Regis Bal Harbour has many combined units. In one of the largest condo transactions in history here in Miami, five combined units sold for $24.5 million last July. Most of St. Regis floor plans are over 3,000 square feet to begin with, even before being combined! One extreme example of these mega-condos is at The Setai in South Beach. There a family began by purchasing a pair of side-by-side units in the building, then began offering buyouts to their neighbors. It took eight years, but the family was able to combine five units for a total of 5,400 square feet on the 33rd floor. You gotta have room for your billiards room, full sauna and massage areas. Oh and wine cellar.